MODERN ON CLASSIC KITCHEN / Architecture, Interior Design CGI. [PT] Projecto de visualização de interiores para exibição de uma cozinha de carácter moderno inserida num contexto ambiental de cariz clássico. Objectos e equipamentos inseridos no ambiente: fornos e máquina de café Miele; torneira de encastrar Vola; torneira de lava-loiças Schock, bancos altos About a stool by Hay; cadeiras Coquille-L by Domitalia; candeeiros suspensos Caravaggio by Cecilie Manz, robot de cozinha KitchenAid. 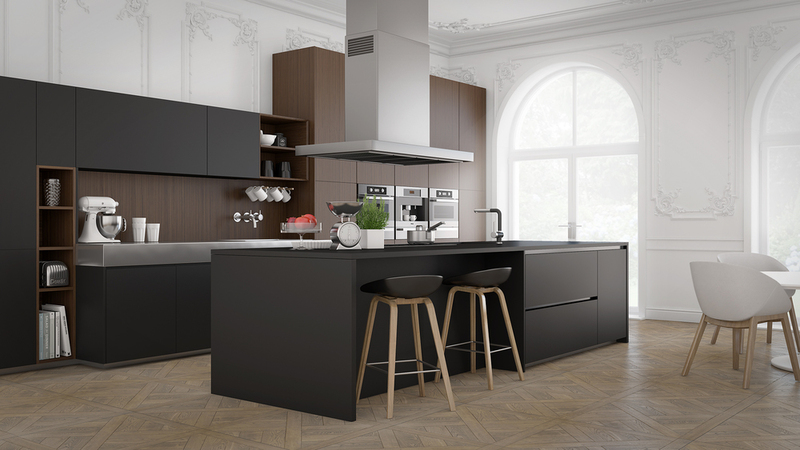 [EN] Interior visualization project to display a modern kitchen inserted in an environmental context of a classic interior. Objects and equipment included in this environment: oven and coffee machine by Miele; wall tap by Vola; kitchen sink tap by Schock, barstools About a stool by Hay; chairs Coquille-L by DOMITALIA; ceiling lamps Caravaggio by Cecilie Manz, food processor by Kitchenaid. Task / Scope: CGI Production for Marketing.